It’s been ten years since Universal Home Video released Knight Rider on DVD, first as individual season boxed sets, then as a Complete Series package. 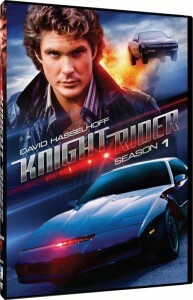 Now Mill Creek Entertainment is reissuing Knight Rider Seasons 1 and 2 on May 3rd. Both full-season sets are $14.98 SRP, with the episodes spread across 4 discs. With the episodes newly remastered in high definition, can a Blu-Ray release be far behind? Mill Creek have licensed a clutch of other classic shows from Universal including Airwolf, Miami Vice, Quantum Leap, Sliders and The Rockford Files – with Airwolf getting a Blu-Ray release on the same day. Knight Rider on an HD format may not be too far away, especially after a Blu-Ray set has already hit the shelves in Japan (albeit with mixed reviews). Today’s Hero, Driving the Car of Tomorrow! 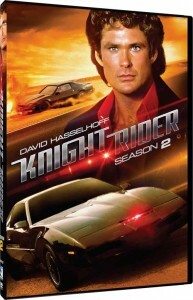 Gear up for action with superstar David Hasselhoff and his supercar, K.I.T.T., as they throttle crime in every high-octane episode from the first season of Knight Rider. The series follows the thrilling adventures of Michael Knight, a detective thought to be dead, who’s been given a new face and identity. His assignment: to fight crime with the help of an artificially intelligent, talking car named K.I.T.T., a high-speed, futuristic weapon outfitted with high-tech gadgets and a personality of its own. Starring David Hasselhoff (TV’s Baywatch), Edward Mulhare (Von Ryan’s Express), Patricia McPherson (Prime Risk) and William Daniels (TV’s Boy Meets World), with guest stars Richard Basehart (TV’s Voyage to the Bottom of the Sea), Richard Anderson (TV’s The Six Million Dollar Man), Maria Conchita Alonso (The Running Man), Charles Napier (Rambo: First Blood Part II), Alan Oppenheimer (TV’s He-Man and the Masters of the Universe), William Sanderson (TV’s Newhart), Alejandro Rey (TV’s The Flying Nun), Tina Louise (TV’s Gilligan’s Island), and Tony Dow (TV’s Leave It To Beaver). Starring David Hasselhoff (TV’s Baywatch), Edward Mulhare (Von Ryan’s Express), Rebecca Holden (The Sisterhood), and William Daniels (TV’s Boy Meets World), with guest stars Barbara Rush (When Worlds Collide), Catherine Mary Stewart (Weekend at Bernie’s), Dana Elcar (TV’s MacGyver), Geena Davis (Thelma & Louise), Bernard Fox (TV’s Bewitched), Robert Pastorelli (TV’s Murphy Brown), Thomas F. Wilson (Back to the Future trilogy), Jo Ann Pflug (M.A.S.H. ), Cameron Mitchell (TV’s The High Chaparral), Robin Lively (The Karate Kid, Part III), Lydia Cornell (TV’s Too Close for Comfort), Kurt Fuller (Midnight in Paris), Ann Turkel (Humanoids from the Deep), John Vernon (Animal House), Joanna Pettet (Casino Royale), Apollonia Kotero (Purple Rain), Catherine Hickland (TV’s One Life to Live), and Stuart Whitman (The Comancheros). More information as we get it! This entry was posted in Blu-Ray, DVD, Knight Rider, Merchandise, Original Series, Site News and tagged Knight Rider. Bookmark the permalink. I,m So Very Excited For It I,m A Great Big Gigantic Huge Knight Rider Fan I Can,t Wait For The Re-Release Of The DVD,S It Would Make For A Most Wonderfull 35,th Birthday Present This Year And Boy I Really Cant Wait.